*Unfortunately, the fireplace is not for guest use. DETAILS: This gorgeous home in the Park District offers all the luxury you've come to expect at WaterColor. The gourmet kitchen is a culinary paradise, featuring gorgeous custom cabinetry, stainless steel appliances, a gas stove and granite countertops. A breakfast bar seats three, while the dining area seats 10. The living room is handsomely decorated and will be a favorite for the entire family, as it includes an entertainment center with a TV/DVR and a stereo system. An open loft area overlooks the living room. The master suite features a king bed, the second bedroom a queen and the third bedroom a queen. All three are on the first floor. The hallway has a built-in bunk beds and the loft, which has a TV and 3 twin beds. The viewing tower also has two twin beds. The outdoor living spaces are what truly set this home apart. 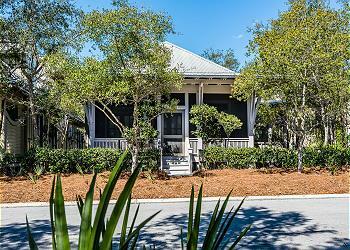 A furnished screened-in balcony and front porch are great places to relax in the evening. Perhaps the most spectacular feature is the fourth-floor viewing tower which is accessed by a steep metal spiral staircase. Enjoy an evening with friends and family gazing out at the stunning view of the Emerald Coast. High-speed wireless Internet access is available. You'll also enjoy the convenience of a carport. Of course the neighborhood pool is just down the street. This home sleeps 11. We loved staying at this house! 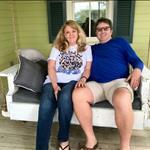 It was beautiful, comfortable and had everything we needed for a truly enjoyable stay. We loved being within walking distance to the festivities with the Vera Bradley Seaside Marathon. Mike & I stayed in the bedroom in the corner on the first floor across from the bunkbeds in the hall. The crow's nest and the bunk beds are a great touch! The bed and linens were so comfy! Thank you! We are so glad you all enjoyed your time with us at this amazing home in Watercolor! We absolutely love the photo you shared and we hope to host you all again very soon! We traveled with 3 families, and this house had plenty of room for every one. During our stay we only encountered very minor construction noise next door, but for the most part it was not even noticeable. We spent most of our time at the beach, the house is only a few blocks away, making it easy to hop on the bikes and go. Also a super short ride to seaside town center, loved the convenience. The kitchen & living room was very open and had seating for a large group. Only complaint is there was no where to store your food/liquor. The cabinets all had cooking utensils in them, and we had a hard time finding room to put our groceries. There were a few minor issues, like a broken blender, but 360 sent over a replacement when we called and asked. Also, A few of the rocking chairs outside were rusted. I believe the house is for sale, so maybe the old owners aren’t interesting in investing into it currently? Over all a great house for a large group, we would stay again. We are so delighted that you enjoyed your stay with us in Watercolor! 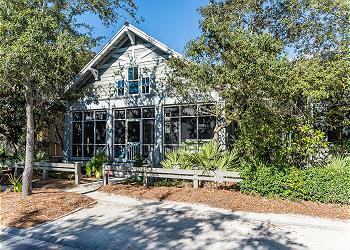 We agree that the location of this home is perfect for a fun and relaxing beach getaway. We will be sure to share your valuable feedback with our team and we are glad that any issues expressed to 360 Blue was taken care of quickly. Thank you for staying with 360 Blue, we hope to see you again soon! We enjoyed our stay in Watercolor! The House was spacious and well laid out for 9 people to co-exist without being crowded. The neighbors on either side have homes under construction and that was a bit loud early in the morning and the dishwasher was not working, but Blue 360 was prompt to try and fix the problem. Overall the home was nice and we would stay there again! We are so delighted that you enjoyed your stay with us in Watercolor! We agree that this home is perfect for larger groups and families! We do apologize for the inconveniences felt during your stay but we are glad that our team was responsive in attempting to fix the dishwasher. We look forward to seeing you again soon! I booked this house for my cousins bachelorette weekend. There were 7 girls and while we did have plenty of room and the house was clean, the house is in need of cosmetic updating. The bathrooms are old and stained with years of use. Instead of curtains they stuffed pillows in the windows... The house does come with bikes but they were rusted and chains off, when I called to get them fixed it took 2 days with repeated calls to get a repairman. We were only there for 3 days so we really didn’t get to take advantage of the bikes, and that’s the nice thing about the area is riding bikes around, and the fact this house is a little farther out from the town center than I would have liked...the bikes were a big disappointment. This was not an issue for our group but to get to the main living area/kitchen you must be able to climb stairs. There are ground entrances but they only lead to bedrooms. Overall the house was nice and it was clean. We apologize for the inconveniences felt during your stay and we will be sure to share your valuable feedback with our team. We are glad to hear that you and your group arrived to a clean house with plenty of space, however, we always strive for perfection. We do hope to see you again very soon! I wanted to book a vacation for a family reunion and this house was a wonderful place that accommodated my family of 12. 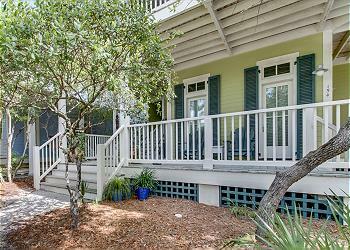 Location was excellent with close proximity to 30A and beach access. My favorite part of the trip was riding bicycles throughout the incredibly beautiful WaterColor community. Paddle boarding was so fun that we went two days in a row! We rented a golf cart and that was loads of fun for the kids and adults alike. I'd love to come back as soon as possible! We are so delighted that you and your family had such a wonderful vacation with us in Watercolor! We agree that this home is a perfect option for large groups or families and the location is great! Thank you for sharing that adorable picture with us! It's easy to see how much fun you all had! We look forward to seeing you again very soon! Beware of construction! Right next door, total rehab. Very noisy, Mon-Sat, 7am-5pm. The workers parked their cars all along the street, and in front of our house, often partially blocking our driveway, as well as the driveway next door. The houses are just feet apart. The workers were not shy about looking in the windows or watching us on the porches; it\'s fair to say that some stared. The house is indeed as described, spacious and very nice, but we couldn\'t fully enjoy it. I would not have chosen this house for a family vacation, had I known about the construction. 360 Blue has since put a disclaimer at the bottom of the web page for the property, sighting the \"possibility of potential renovation noise from a neighboring property.\" The does not begin to describe the inconvenience. Thank you for your feedback. We are thrilled that you enjoyed the home but so sorry to hear that the construction was disruptive. WaterColor is still expanding and there are growing pains associated with that. We are working closely with the HOA to monitor construction progress and ensure local contractors are being respectful of guests and local ordinances. We sincerely hope that despite this your family was able to make some amazing memories during your time at the beach. The photos did the house justice, we were disappointed that none of the windows opened bc it was perfect weather outside, we tried to spend as much time on the porch as possible (the main reason we rented the house and our idea of a beac vacation isn’t sitting in AC) but the House next door is under construction so it was really loud out there even on Saturday. It made us not want to spend time at the house. Probably would not rent through 360 again.